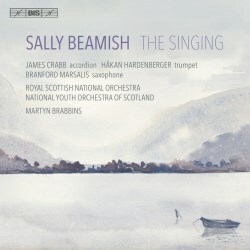 London-born but now living in Scotland, her adopted home, Sally Beamish is one of those much-garlanded contemporary composers who is both fiercely original and utterly approachable. I first heard her music at the BBC Proms some years ago and, more recently, was much impressed by her Concerto for Saxophone Quartet and Strings (review). As so often BIS have shown their commitment to living composers by recording a number of her works. Their CDs of the Second Viola Concerto, String Quartets, Bridging the Day, The Caledonian Road and the Cello Concerto have all been reviewed on these pages. The RSNO, National Youth Orchestra of Scotland and the indefatigable Martyn Brabbins are joined here by an impressive array of soloists; the classical accordionist James Crabb, the sax player Brandon Marsalis – last encountered in John Williams’ Escapades – and the trumpeter Håkan Hardenberger. The latter made a thrilling impact in Prières sans Paroles, with organist Simon Preston (BIS 1109). Crabb gets the top spot with Beamish’s now feisty, now haunting piece The Singing. The composer gives a detailed explanation of the work in her liner-notes, but even without them the music’s core, a deep-rooted vocal tradition, is unmistakable. The accordion part is very imaginative and all the musicians acquit themselves well. Beamish strives to transmute words into music – a process that’s rather more subtle than imposing a simple programme - so it’s no surprise that she chose George Mackay Brown’s novel Magnus as the inspiration for A Cage of Doves. It tells the story of the 12th-century Earl of Orkney, put to death by his cousin Haakon. The latter’s memories of their childhood together include images of ‘rock pools … [and] … a cage of doves’. The music is at once tough and tender, agitated and contemplative; the splendid recording captures to perfection those woodwind calls and the crash and spray of drum and cymbals. Indeed, this is a good starting point for those keen to explore Beamish’s oeuvre. Under the Wing of a Rock, originally written for viola and strings, tells another dark tale. This time it’s about a mother and child fleeing the massacre at Glen Coe in the Scottish Highlands in 1692 and the soldier who was sent to kill them. Instead, he was so moved by the mother’s Lullaby of the Snow that he spared them. The text – a prayer, really – is heartfelt, and Marsalis’s gentle ‘voice’ is profoundly moving in its simplicity and strength. Brabbins coaxes glowing sounds from his band, who also play with silk and sparkle when required. From its sheltering title to its love of song and unique landscapes this piece is a perfect synthesis of all that the composer holds dear. Beamish then modulates into a lighter key with the ‘cartoon music’ of Reckless, which she wrote for the young players of London’s Southbank Sinfonia. It’s an engaging and affectionate knockabout that conceals some virtuosic writing for all sections of the orchestra. Her passionate belief in writing for such ensembles is epitomised by the Trumpet Concerto, written for - and played by - the National Youth Orchestra of Scotland. I suppose one could call it a set of urban imaginings, inspired by Italo Calvino’s Invisible Cities. Hardenberger is simply stratospheric in the first movement, his young accompanists responding with alacrity and style. This really is a gorgeous concerto, its second movement essayed with a metropolitan languor that brings to mind Bernstein and Daugherty. I was also much impressed by the orchestra's very robust brass section. No modern cityscape would be complete without its metal cast-offs, hence the use of scrapped car parts and scaffolding pipes in the controlled chaos of the work’s finale. The crunching kaleidoscope of different rhythms and sonorities makes for a rousing racket, all of it crowned by the secure, high-lying virtuosity of this extraordinary soloist. Great fun. Highly inventive, emotionally complex and consistently inspired this is Beamish at her considerable best; cracking good sound, too.